You are here: Home / Art For Sale / Small Original Paintings / Surf’s Up! 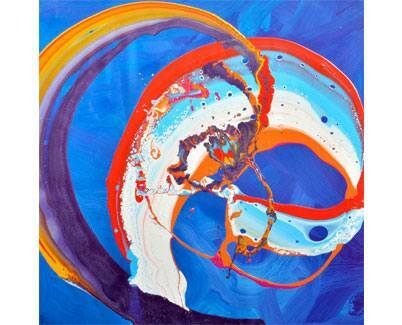 A combination of energizing blues and whites fused with a dramatic series of red, purple and gold colours. Dive in – let’s go! I am not a surfer and have never even been surfing. But I do know people that do and listening tot hem conjours images in my mind of crashing waves, tunnels of water, infinite power, dramatic skies and intense emotions. So I have created a small series of square original art works that are loosely based on the experiences and descriptions of my surfing friends and acquaintances. I haven’t always been so defined on my boundaries between earth and sky but in this painting I have. There is a definitive stop point where the blue ends and the red begins. It has helped me differentiate between the two key parts of the painting. The blue and white part is full of big twists and rolls and is peppered with small circles. The red area has hints of purple and gold and this is the really dramatic part for me – certainly in terms of colour.